Cool tools rule! Keep your little worker busy with hands-on activities and 5 fun Play-Doh tools almost like the ones the grownups have. Cool tools rule! Keep your little worker busy with hands-on activities and 5 fun Play-Doh tools almost like the ones the grownups have. The saw does 2 cool things: cut (obviously), or you can attach the wrench accessory on the handle to squeeze 4 different wiggly, giggly shapes! 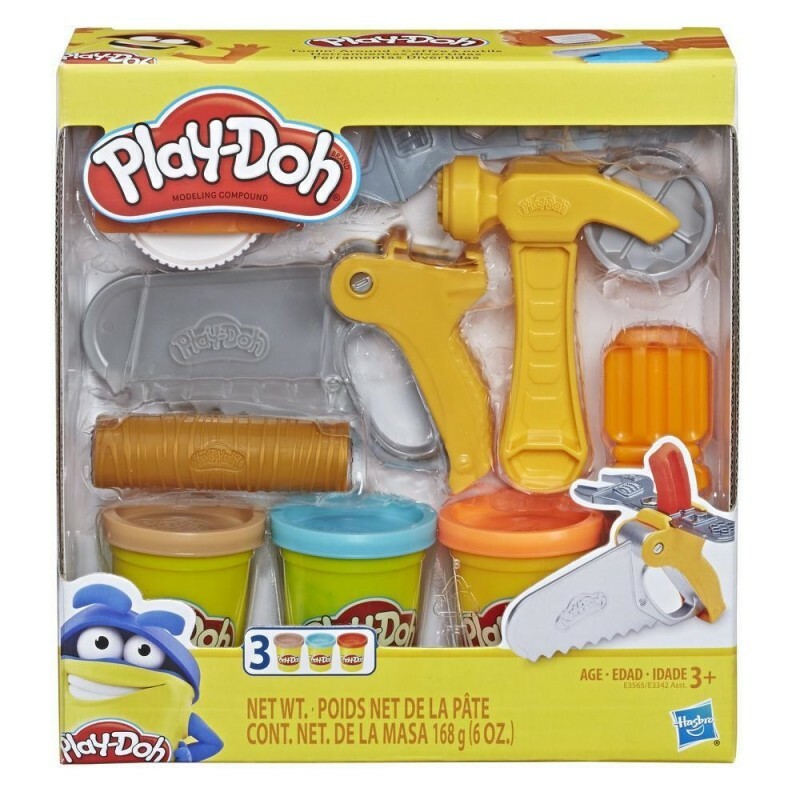 Roll the toy hammer across Play-Doh compound to create hammered nail imprints, and stamp wood textures with the roller. The tape measure also imprints Play-Doh compound with measurement lines, and the screwdriver works just like a kid-friendly knife. This handy dandy creative toy comes with 3 different colors of non-toxic Play-Doh compound in 2-ounce cans, and it makes a great rainy day activity or inexpensive gift for kids ages 3 and up. • Includes hammer rolling stamper, tape measure rolling stamper, saw tool, screwdriver cutter, wood texture roller, and 3 cans of Play-Doh Brand Modeling Compound (net weight 6 oz/168 g). • 5 HANDY DANDY PLAY-DOH TOOLS – Kids can imagine and build with these fun tools just like the grownups use (except even cooler because they're made for playing with Play-Doh compound!) 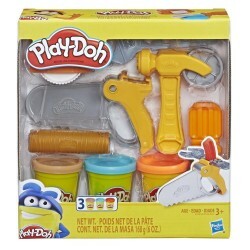 • TURN YOUR TOYBOX INTO A TOOLBOX – These kid-friendly tool toys feature a toy hammer, saw, tape measure, wood texture roller, and screwdriver (all plastic, of course). • KEEP YOUR LITTLE BUILDER BUSY – Create everything from wood and nail imprints, to measurement lines and hammer stamps, and more. No trip to the hardware store necessary! • 3 PLAY-DOH COLORS – With 3 non-toxic Play-Doh colors in 2-ounce cans, this activity set is perfect for any little creator who loves modeling clay and other arts and crafts for kids.